I talked with a friend and long-time business owner about our businesses. We’ve both done essentially the same thing for 40 years. Yet what we do and how we do it has transformed. Now he’s still in the same business, photo processing, yet using a completely different approach and reaching new audiences around the world. He repositioned his whole business based on his expertise in photography and photo processing. Yet what he provides now and how he captures attention has evolved to meet demand. With 63,000 followers on Instagram and a consistent program to post beautiful images, new customers from every hemisphere have discovered his services. His website helps professional photographers order prints online, from traditional film or digital files. Lots and lots of beautiful photos shipped across the country and around the world. As he told me, with the cost of shipping so low, he can ship nearly anywhere. He rebranded and repositioned his company–without changing the name–to reach a whole new world of new customers and provide what they were looking for. Positioning is the art and science of understanding the essence of who you are and what you provide. At the heart of a rebrand is that deep dive into what makes your company tick, what brings delight to your customers, and where you can find and reach more of those people. What is your expertise? What do you offer that your clients and customers love and talk about? How can you take that knowledge, experience and expertise to new customers–younger, in different regions, in a different way? The examination of what makes you unique, while considering how you could reach more people is the foundation for choosing to rebrand. A rebrand is not simply a new logo and color palette, or some new messages tacked on to what you’ve been saying all along. In today’s accelerated-pace, global-reach, online-driven culture, understanding where you must be in a year or five is vital. Why rebrand? As they say, evolve or die. How do you know if it’s time for a rebrand? Of course you can do a deep dive into your company’s essence and establish a new direction without a rebrand. But look closer, does your brand (the words and visual system, the marketing tools) fit who you are or how you want to be known? Does the brand system reflect those new audiences who expect more for less, faster response, a social media presence and online access? Does your current brand message and identity lift you above others in your category? Or have you slipped behind? Yes, design matters. And the right words count. A powerful brand is both visual and verbal. Your brand will help your organization be seen and known. We are a culture full of impatient people. We’re blitzed daily by words, ideas, pictures, videos, social memes … all demanding attention NOW … it’s tough to stand out and be seen. Global competition for attention, products and services tests us all, daily. How has your business altered to keep up? Or has it? You may have seen revenue faltering. Or realized your sales team is not as successful as they’ve been in the past. You might have noticed the phone is ringing less and there are more inquiries online than in person. Many manufacturers have seen attendance at previously successful trade shows drop. Or younger staff members are asking for online tools–from social media to cloud-based apps. Take a hard look. What has changed in your business? In your category? In the audiences who are your customers or referral base? Just as technology has altered communications forever, technology changes have shifted your interactions with your current and potential clients. Which affects the future of your business. Our blog post on a rebranding definition will tell you more. You can’t ignore the huge changes around you. Just as my friend in the photo business had to embrace the new digital world with his capabilities, you must embrace what’s coming and not hang on to the way it has been. Is it time to ditch the past to seize your future? No matter who you are or where your business is going, take a step back. Evaluate your position, where you fit, what your audiences expect now. Then examine your brand–your visual and verbal identity. Does it fit the future you envision. Does it appeal to the audiences you must reach to be successful? Learn more about branding, the difference between a full rebrand or a brand refresh, on our website. 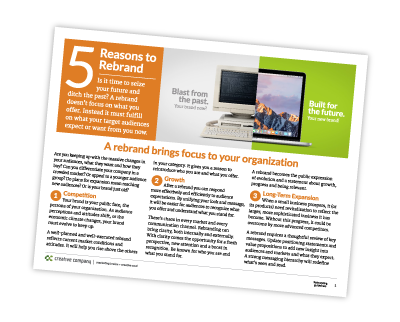 Download our updated Rebrand Guide below, it could give you clarity when you realize some of the reasons outlined are true for you. You can also learn more about the branding process here, from audit to launch. You may also be interested in a brand audit before you commit to a rebrand. Our objective review of your current brand will inform your decision and give you new insight.